On today’s episode, I get back to skating equipment and we talk about roller skating boots. What are the different types of skate boots out there? Which skate boots are typically used for which type of skating? And finally, a few tips for buying your next skate boot. Here are a few of the items I mentioned during the show. These are some of the better skating boot sizing charts that I have seen. Now, these only work for Riedell boots, but I like how they have these laid out. If you are looking to find a dealer near you who can help you measure your feet to get the best fitted skates, then checkout the link above. While doing some of my research on boots, I found this site to have some good information about derby boots. Another link for Derby Warehouse who have a pretty good collection of the different boots out there that are heat moldable, along with instructions for how to heat mold a boot by manufacturer. This is the post I mentioned in the show that I wrote a couple of years back. It covers all of the different things I tried to get my Vanilla 360s to feel comfortable. It also goes over eZeefits in more detail. Here is a link to the eZeefit ankle bootie on Amazon if you are interested in getting a pair. Please note, I do get a small commission from Amazon (no extra charge for you) if you purchase through my link. Jeff Stone: 00:03 Hey everybody, welcome to the Roller Skate Dad podcast. This is episode number eight. Let’s get started. Jeff Stone: 00:36 Hey everybody, welcome to the Roller Skate Dad podcast. Thank you guys so much for being here. After doing a few interviews over these past couple weeks, I thought today we’d focus back onto skating equipment. I get lots and lots of requests from all of you guys out there in my audience to go over more and more skating equipment. So today I thought we would talk about roller skate boots. Jeff Stone: 01:01 So for today’s show we’re going to be talking all about roller skating boots. More specifically, what are the different types of skate boots that are out there, which skate boots are typically used for the different types of skating. 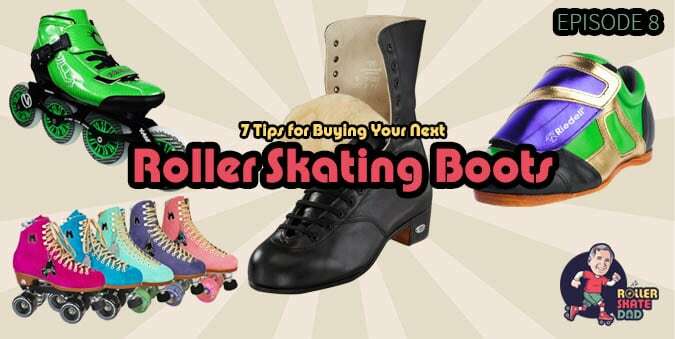 And finally a few tips for buying your next skate boot. All right, we got a lot to cover. Let’s go. Jeff Stone: 01:21 First. Let’s talk about the different kinds of boot cuts that are out there. This is the different kind of style of boot that we’re talking about here. Jeff Stone: 01:32 So first we have the high top boot or what I like to call the classic roller skate. These are the boots that are really tall and they go, you know, halfway up your shin. You typically find the high cut boot on quad skates, old classic time quad skates as well as rollerblades. The other kind of boot cut is a low cut boot. Low cut boots are typically found on quad skates as well as on aggressive inline skates. Jeff Stone: 02:04 And even on low cut boots there are three different types within it. Low cut, a standard cut or a higher cut. The low cut is where the boot actually goes under the ankle bone, whereas the standard cut goes just over the ankle bone. And finally the higher cut goes completely over the ankle bone and up the shin just a little bit, not as high up as a high top boot would the old classic high top boot, but a little bit up the shin. Jeff Stone: 02:37 This extra height on these boots give you more stability and a little bit more control over your skating, whereas the lower cut boot gives you more flexibility. Jeff Stone: 02:48 Next, let’s talk about the type of skating you’re doing and what boot cut type might be best for you. If you’re doing artistic skating or rhythm or outdoor or playing roller hockey, you’re typically going to be going with a high top boot. If your a speed skater or a jam skater or you play roller derby, then more likely you’re going to be in a low cut boot. Jeff Stone: 03:11 So next we’re gonna talk about high top boots and low cut boots and what the advantages are of each type. So first, as I said before, high top boots are going to provide more support around the ankle area. So it gives you the feeling of more stability with that higher top boot. That extra boot on the high top boot going up your ankle and your shin area gives you more support. Jeff Stone: 03:36 This is why figure skaters use a higher top boot. You know, it gives them more stability when they’re doing jumps or spins. For those who care about looks. It’s also a more of a classic style to roller skates. This is the original roller skate with the higher cut boot, you know a throw back. The traditional ones mostly come in black and white. However, manufacturers like Moxi skates and Roller Derby’s Candi Girl series are bucking that trend nowadays and they’re coming out with really colorful, super bright boots. Jeff Stone: 04:11 On the flip side, low cut boots offer less ankle support. You typically see low cut boots worn for speed skating and for roller derby. The low cut boot gives extra flexibility so it’s helpful in keeping a tight edge as the speed skater digs deep into their edge. This is one reason why you see all aggressive inline skates with a low cut boot. Jeff Stone: 04:35 So now that we’ve gone over the cuts of a boot and the different types of boot that you would use for the different types of skating that you might be doing, let’s talk next on a few tips for buying boots. And while I’m giving you, these tips we’ll go into more depth on what makes up a skate boot and the different things that you should be looking at when deciding what your next skate boots should be. Jeff Stone: 04:59 One of the hardest parts about shopping for roller skates these days is that most people can only buy their skates online. I mean you can still go to some mega stores to buy skates, like Walmart Academy, etc, but you know, all those skates in those mega stores, they’re not any good. They’re really for the absolute beginner or the first time child skater out there. You know, and shopping online is great because it allows us to shop and buy from anywhere, but it’s also super hard to get just the right boot without being able to try the skates on. Jeff Stone: 05:33 And for some of you out there who are listening, I know you don’t have a roller skating rink or a skate pro shop nearby, so that makes it extra challenging. I mean, don’t get me wrong. It’s great that we have all these online stores and it’s awesome for picking out wheels and bearings and things that don’t necessarily have a size, but when it comes to a boot you want that boot to fit perfectly. So here are some tips for you to help you pick out that right boot the next time. Jeff Stone: 06:02 Tip number one if possible, try your skates on before you buy them. So if you have a roller skating rink in town or a skate pro shop in town, my recommendation would be go to them first. Even if you decide not to buy your skates from the skating rink or from the skate pro shop because you can find them online cheaper, it’s good to go to a professional who actually knows how to look at your foot and can help you measure it correctly to find out the right size. Jeff Stone: 06:34 The other reason why going to a rink or a pro shop to try stuff on is that you actually get to try on lots of different boots and that’s really how you’re going to determine what you like best is by trying them on. If there is no skating rink or a skate shop in town first I, I’m sorry I wish there was but if there’s not find friends or other skaters who have a similar skate size to you and try them on. Trying things on is a great way to determine what we like. Skating is no different. Now, the biggest challenge is going to be finding people that you know that actually have the same shoe size as you. But if you have enough friends, you have enough people in your community that shouldn’t be a problem to at least be able to try on a few different pairs of skates. Jeff Stone: 07:20 Now, a lot of the skates sites that are out there selling skates will tell you that the skates are the same as your shoe size. And while that may be true, 80 to 90% of the time I’ve found that’s not always the case. Some people’s feet are wider, some people’s toes are longer. It really is just like trying on a pair of shoes. However, the big difference with a pair of skates is that you’re going to actually be pushing and jumping hopefully and spinning and doing things you don’t normally do in a pair of shoes. So you want them to be comfortable and the best way to determine what’s comfortable to you is to try them on. Jeff Stone: 08:02 Every manufacturer who makes a skate boot does things just a little bit different. Some have extra padding, some have cushy insoles, some have paper thin insoles, some have a perfectly comfy boot, but something is sticking or poking out of the boot, like my Vanilla 360 debacle. Jeff Stone: 08:21 You know, that was a great overall skate, but the boot was horrible because it had this rough cut on the outside ankle that I just couldn’t get smoothed out or corrected. So just like shoes, skates are something that you’re going to be wearing, you know, three, four times a week, maybe 10, 20, 30 hours a week, you want them to be comfortable. Jeff Stone: 08:44 Tip number two, if you can’t try on your skate boot before you buy it, than at least find the skate sizing chart from the manufacturer. There are many people out there that don’t that most roller skating retailers as well as roller skating manufacturer’s websites have a skate sizing chart. Sometimes these skate sizing charts are buried. You know, if you don’t see them on a site that you’re trying to buy a pair of skates on, try to look up the manufacturer of that skate and see if they provide a sizing chart. Not every retailer has a chart on their website, but almost all manufacturers do. Jeff Stone: 09:22 This is important because you know there’s a lot of difference in sizes between manufacturers sometimes. For example, some skates only come in men’s sizes, so if you’re a lady out there, you actually have to go down a size. So, If you wear a lady’s 10 you actually wear a men’s 9. And on the flip side, some roller derby skates and other skates out there only come in women’s sizes. Jeff Stone: 09:50 The best skate sizing charts that are out there come with materials and guides that you can actually print out on your home or work printer and they walk you through the steps of actually measuring your foot for that particular skate boot. They’re pretty simple to follow along, but it does take a few measurements to get everything just right. Also, a little side tip, when you’re printing out these guides that actually help you measure your foot, just make sure that you’re actually printing out at 100% actual size on your printer. Otherwise your measurements will be completely off. Jeff Stone: 10:27 One example of a manufacturer who makes a really good skate sizing chart is Riedell. Riedell is a really popular US based manufacturer of roller skates who makes really comfortable boots. Honestly, I think they’re some of the most comfortable quad boots on the market today. Anyways, they have a really nice sizing guide for both low cut boots as well as for high cut boots that they make. I’ll post a link to both guides in the show notes. What I like most about the Riedell sizing guide is that they’re not just measuring the length of your foot. On Riedell’s sizing guide, they’re actually measuring the length like all the other manufacturers, but they’re also measuring your foot’s width. For those of you with wide feet out there, there’s actually three or four options with most Riedell boots to get them in these different widths. Jeff Stone: 11:20 This is a pretty big deal because many boot manufacturers don’t actually make boots with different widths in the same size length. Riedell is one of the few that provides this, so if you have wide feet, you should definitely check them out. Plus many of their boots are made right here in the USA. Jeff Stone: 11:37 Now Riedell does put all over their skates sizing guide that they do provide this tool for you to use to actually measure your foot’s length and width for their skates. However, their number one recommendation is that you go into a skate shop or into a skating rink that is a distributor for Riedell and have them accurately measure your foot so that you can get the best fit. I’ll post a link to Riedell’s retailer and distributor look up form in the show notes. Jeff Stone: 12:09 Tip number three, pick the best skate boot materials for your skate level and your pocket book. Much like anything else in life, the old adage applies. You get what you pay for and roller skate boots are no different. If you’re an avid roller skater and you plan to be skating a lot, then saving up and going with a better boot material, will give you better performance and more durability in the long run. Jeff Stone: 12:36 Leather boots are by far the best choice for quality, durability, and performance. A leather boot over time will fit tight and will stretch to a nice formed fit. However, when you first get a leather boot, it’s going to take some time to break it in. It’s going to be pretty tight. You know, much like a pair of leather shoes or any other kind of leather, you know, piece of apparel that you own and it’s going to take some using to actually get it broken in. So you’re going to have to use your boots a lot before they actually start to become more malleable and form fitting. Jeff Stone: 13:12 So you’ll need to use it a lot to get the leather boot to break in. You know, when you first pull it out of the box, it’s going to be stiff. But with time on your skates, the boots are going to become more comfortable and leather boots are going to be more expensive. They’re going to cost you more money. For those adult skaters that are out there whose feet aren’t growing anymore, leather may be a perfect choice for you. If you’re a first time parent just teaching a brand new child how to skate, it may not be the best option for you because your child’s feet are going to grow so quickly that you’ll be replacing those expensive boots rather quickly. So for those of you out there who want more comfort, durability, and the best performance, leather is definitely the best way to go. Jeff Stone: 13:58 While doing my research, I also found that leather comes in a whole lot of different varieties and different grades. Leather also comes in a variety of different grades. Here’s some of the grades I found online from the lowest grade to the highest grade. Bonded leather is the lowest grade followed by genuine leather, then top grain leather then full grain leather. And lastly, we have specialty leathers. Specialty leathers like Kangotan and Chinook. Jeff Stone: 14:31 Besides leather roller skate boots can also be made out of vinyl or synthetic leather. These types of materials are best for the newer skater or for kids whose feet are still growing, mainly because they’re cheaper. Vinyl and synthetic leather are usually heavily padded and comfortable, especially when they first come out of the box, but they’re not nearly as durable or as long lasting as leather. They’re also not as comfortable as leather in the long run. Jeff Stone: 15:03 Vinyl and synthetic leather will actually be more comfortable when they first come out of the box than a regular leather boot. However, with time as you work that leather boot, more and more, the leather boot will actually become much more comfortable in the long run. So one upside of vinyl or synthetic leather is that there’s very little break in period on those new boots. It usually feels softer when you first take it out of the box and it usually stays that way. Now they don’t stretch and they’re not as durable as leather, so they’re not going to last you as long. But as I’ve said before, having your own skates is really what’s most important. It’s how you get better practice practice, practice. It’s hard to do that if you don’t have your own pair of skates. Jeff Stone: 15:53 Lastly, on many aggressive inline skates, we also have materials like carbon fiber and fiber glass that go into boots. These boots are heat moldable to get that really snug fit. We’ll talk about heat molding here in just a minute. However, there’s a big difference in price and the material is a big factor and what determines the cost of the boots? Most leather boots are going to start at about $150 and go upwards of $500 or more, and that’s just for the boot. You still have to buy a skate plate, wheels, bearings, toe stops, so it can add up quickly. On the flip side, most vinyl boots are at least half that cost or even less. Jeff Stone: 16:37 For many of us out there buying a boot, we’re also trying to build our own custom skate. And for a really pair of awesome custom skates, it’s not unheard of to spend $500 or even $1,000 or more on a pair of skates. But honestly it makes a really big difference. There’s nothing better than a really comfortable pair of awesome custom skates. Again, not for the beginner out there, but if you’re an experienced skater, making your own custom skates is both fun, educational and a great way to get an awesome pair of skates. You just learn so much about roller skates when you build your own. Something we’ll cover in a future podcast episode. Jeff Stone: 17:20 Tip number four, see if your boots are heat moldable. So, some skates are heat moldable or have spots on the skate that are heat moldable, so if there’s a spot on your skates that are bothering you, check to see if your skate is heat moldable. If a skate is heat moldable, it usually will say so on the retailer or the manufacturer’s website. If you don’t see it, be sure to check out the manufacturer’s website just to be sure. Most skates that are heat moldable, will have a link that takes you to a page that shows you how to heat mold that particular boot. The process is fairly similar, but it does differ a little bit from manufacturer to manufacturer based on the type of materials that they’re using. As I said earlier, a lot of aggressive inline speed skates are heat moldable, but some quad skate boots are heat moldable as well, but I’ve seen it mostly with inline skates. Jeff Stone: 18:14 Now heat molding is not a silver bullet. It’s not going to fix your skate boot if it’s one or two sizes too big or too small. You know, the only thing that’s going to fix that is you know you need to go get the correct boot, but if you want an extra good fit, heat molding can certainly help. I’ll put some links in the show notes to websites that we’ll show you how to heat mold, different kinds of skate boots. Jeff Stone: 18:36 Tip number five, understand the type of liner and insole that is on the inside of your boot. First, let’s talk about the liner. The liner is the inside of the boot. It’s the part that goes on the tongue and the inside walls of your skate. There are three different types of padding that you can find on the inside of a skate boot. Padded fabric, fabric and leather. Padded fabric is what is in most cheap level boots. It feels the most like tennis shoes or sneakers. Fabric includes materials like DryLex, Cambrelle and Micro Fiber liners. These are picked because they handle moisture better and they’re more comfortable. Finally, leather liners come on some of the top end boots. As stated before, leather is the most comfortable and best for performance because of its ability to stretch and form to your foot. So again, if you’re looking for top of the line leather’s the choice. Jeff Stone: 19:37 Next, let’s talk about the insole. The insole is the flat part inside of your boot that the bottom of your foot rests on. Some skates come with a really nice thick insole on the bottom of the boot. Other skates I’ve bought seemed like they didn’t have an insole in them at all. It just depends. The great part about insoles is that you can actually buy new insoles and cut them down to fit. Most skate manufacturers sell additional insoles that you can buy to either replace your existing ones or add more cushion, but you’ll want to remove the old insoles first and secure the new ones with a few dots of glue so that they don’t move around. Jeff Stone: 20:17 Tip Number six determine how the outsole of your a skate boot is constructed. Outsoles are the bottom part of the boot. The part the skate plate attaches to. Outsoles are usually made out of leather or rubber. Leather outsoles are stiffer and provide a better performance overall for the boot. Jeff Stone: 20:37 Next outsoles are typically either glued onto the boot or they’re stitched onto the boot, stitched outsoles are more durable. It’s less likely that the boot will come apart on a stitched outsole, whereas a glued outsole does have that ability to come apart. So better boots are going to come with a stitched outsole, whereas your cheaper boots are going to come with a glued outsole. Go with the stitched outsole if you can afford it. Jeff Stone: 21:03 Tip number seven, have a pair of eZeefits to help, especially when you’re breaking in new boots. For those of you who have listened to my other podcast episodes, I’m sure you’ve heard me talk at length about eZeefits, but my eZeefits have really gotten me through some tough boot breakins before. For those of you who don’t know eZeefits are a special padded ankle booty that you slide over your foot before you skate, it’s kind of like a sock, but it’s super padded. They come in three different thicknesses, one millimeter, two millimeter and three millimeter allowing you to choose what level of padding you want. And they cover the heel, ankles and half of the base of the foot just before the toes. Jeff Stone: 21:46 It’s a really great product. If you have a pair of skates you love but you’re having issues with the boot, then I highly recommend picking up a pair. You can get a pair from Amazon for less than 25 bucks. I’ll have a link in the show notes to my article where I show all the different things I tried while I was trying to break in a pair of vanilla 360 skate boots. I’ll also have a link on the show notes to the eZeefit ankle booty so you can learn more. Jeff Stone: 22:11 All right everybody, another episode in the books. And just a quick teaser, but for next week show I’m going to be talking about how you go about opening up a roller skating rink. I actually have a pretty good book and manual that I bought several years ago that kind of walks you through the steps of how to open up a skating rink, so I thought I would review that manual and that book with you on next week’s show. So stay tuned. Jeff Stone: 22:36 Also on February 18th there’s a brand new documentary coming out on HBO called United Skates. On that same day, I also have an interview with the two directors from United Skates that will be on the show – Dyana Winkler and Tina Brown – so that will be a special episode that will be coming to you on Monday, February 18th. Jeff Stone: 23:00 I’m also going to be setting up a special watch party for that debut on February 18th on HBO, so be sure to check out the RollerSkateDad.com website as well as look at your Club emails for more information. Jeff Stone: 23:15 If you want to learn more about anything that I talked about here in this podcast episode or you want to see some of the references that I use to make this episode, be sure to check out the show notes. You can get to the show notes by going to RollerSkateDad.com/8. Jeff Stone: 23:31 Next. If you really want to help out the podcast and help me out, I’d really appreciate it if you rated and reviewed the Roller Skate Dad podcast on your favorite podcasting platform. Jeff Stone: 23:43 Leaving me a rating and a review is how the podcast gets more visibility on things like Apple Podcasts, Google Play, as well as Stitcher and Spotify or wherever you’re listening. So if you’d like to help out the Roller Skate Dad podcast, please be sure to rate and review the podcast wherever you listen. Thank you. Jeff Stone: 24:04 Lastly, if you haven’t already, you’re going to want to join the Roller Skate Dad club. The Roller Skate Dad Club is easy to join. All you need is your name and your email address and you’re in! As a member of the Roller Skate Dad club, you get early access into every contest that I run. Plus you get skating tips and easy access to me and the show. So if you haven’t joined already, head on over to RollerSkateDad.com and join the skate club today. Jeff Stone: 24:33 All right, everybody, that’s another episode in the books. I want to thank you guys so much for being here. So until next week, get on out there and skate. Announcer: 24:44 Thank you for listening to the Roller Skate Dad podcast at www.rollerskatedad.com. If you liked what you heard today, please be sure to subscribe, rate, and review the podcast on Apple Podcasts, Spotify, Google, or wherever you’re listening. Wow! Thanks, Fred, for rollin’ by and dropping me a line. I appreciate you listening. Thank you so much for your feedback. Have a great time roller skating!